Two simple, sensitive and accurate spectrofluorimetric and spectrophotometric methods have been developed for the determination of sparfloxacin in bulk and pharmaceutical preparations. The proposed methods were based on oxidation of sparfloxacin with Ce (IV) in acidic medium. The spectrophotometric method involved the measurement of unconsumed Ce (IV) concentration at 315 nm. The spectrofluorimetric method based on the measurement of reduced fluorescent Ce (III) at 352 nm after excitation at 250 nm. Different variables affecting the reaction such as concentration and volume of cerium (IV), type and concentration of acidic medium, heating temperature and time were carefully studied and optimized. Under the optimum conditions, linear relationship in the range of 0.020.2 μg mL1 and 0.020.1 μg mL1 were obtained using spectrophotometric and spectrofluorimetric methods, respectively. No interferences were observed from the common formulations excipients present in the dosage form of the drug. The proposed methods were successfully applied to the analysis of the investigated drug in pure and pharmaceutical formulations with good accuracy and precision. The recovery percentage ranged from 93102 ± 1.732.66%. The precision of the methods were good; RSD ≤2.55%. Key words: Sparfloxacin, Cerium (IV), spectrophotometry, spectrofluorimetry, redox reaction. Se desarrollaron dos métodos espectrofluorimétricos simples, sensibles y exactos para la determinación de esparfloxacino en preparaciones a granel y farmacéuticas. Los métodos propuestos se basaron en la oxidación de esparfloxacino con Ce (IV) en medio ácido. El método espectrofotométrico involucra la concentración de Ce (IV) no consumido a 315 nm. El método espectrofluorimétrico se basa en la medida de Ce (III) fluorescente reducido a 352 nm después de excitación a 250 nm. Diferentes variables afectan la reacción como son la concentración y el volumen de cerio (IV), tipo y concentración del medio ácido, temperatura y tiempo de calentamiento fueron cuidadosamente estudiadas y optimizadas. Bajo condiciones óptimas, la relación lineal se encontró dentro de los rangos de 0.020.2 μg mL1 y 0.020.1 μmg mL1 que fueron obtenidos utilizando los métodos espectrofotométricos y espectrofluorimétricos, respectivamente. No fueron observadas interferencias de los excipientes en las formulaciones comunes en la dosificación de la forma del fármaco. Los métodos propuestos fueron satisfactoriamente aplicados al análisis del fármaco investigado en formulaciones puras y farmacéuticas con buena exactitud y precisión. El porcentaje de recobro se encuentra en el rango de 93102 ± 1.732.66%. La precisión de los métodos fue buena; DRE ≤ 2.55%. Palabras clave: Esparfloxacino, Cerio (IV), espectrofotometría, espectrofluorimetría, reacción redox. Sparfloxacin [5amino1cyclopropyl7(cis3, 5dimethyl1piperazinyl)6, 8difluoro1, 4dihydro4oxo3quinoline carboxylic acid] is a third generation fluoroquinolones which is the one of the most important and successful classes of manmade antibacterial used in the treatment of lung infection, urinary tract infection and cutaneous allergy. Sparfloxacin (spflx) is receiving attention due to its broad spectrum activity, potency and excellent pharmacokinetic profiles [13]. Different analytical methods have been reported for quantitative determination of sparfloxacin in pharmaceutical preparation like DC polarography , HPLC [46], and capillary zone electrophoresis [3, 7, 8]. Spectrophotometric methods have also been reported based on the indirect determination of sparfloxacin with N bromosuccinimide , ionpair complex with bromothymol blue , ternary complex with Pd(II) and eosin  and UVSpectrophotometry [11, 12]. Few spectrofluorimetric methods have also been reported for the analysis of sparfloxacin. These methods are based on intrinsic fluorescence property or complexation reaction with aluminum chloride , derivatization of sparfloxacin with hydrobromic acid , hydrochloric acid  and potassium iodide . Ce (IV) is a well known oxidizing agent. It is used for the indirect determination of a number of drugs [1724]. The present work was carried out to develop simple and sensitive spectrophotometric and spectrofluorimetric methods for the determination of sparfloxacin in bulk and pharmaceutical formulations based on its reduction of Ce (IV) to Ce (III). The decrease in absorbance of Ce (IV) was measured at 315 nm in spectrophotometric method and the fluorescence intensity of produced Ce (III) was measured at 352 nm with excitation at 250 nm in spectrofluorimetric method. Fluorescence intensity was measured using RF 5301 Spectrofluorophotometer (Shimadzu, Japan) with Xenon lamp (UXL155), Optima SP3000 plus UV/Vis Spectrophotometer (Tokyo Japan), with quartz cells for absorbance measurements and thermostatically controlled water bath (Yu Jia China) was used for heating purpose. All chemicals used were of high grade purity. Ammonium cerium (IV) sulfate dihydrate (reagent grade ACS, Scharlau Barcelona, Spain), sulphuric acid (9598% Merck, Darmstadt Germany) and methanol (Merck, Darmstadt Germany) were used during this work. Standard reference sparfloxacin was gifted by Libra Pharmaceutical Industry pvt. Ltd., Peshawar, Pakistan. Commercial formulations of sparfloxacin (Sparxin, Sparcin and Quspar) were purchased from local market. Sparfloxacin stock standard solution was prepared by dissolving 10 mg of authentic standard sparfloxacin in 10 mL of distilled methanol with vigorous shaking and diluted with distilled water to 100 mL volumetric flask. 10 μg mL1 working standard solution was prepared by dilution with distilled water from the stock solution. Fresh solutions of Ce (IV) were prepared daily by dissolving appropriate amount of ammonium cerium (IV) sulfate dihydrate [(NH4)4Ce(SO4)42H2O] in1.5 M and 1.0 M sulphuric acid, so as to obtain 500 μg mL1 (Solution A) and 100 μg mL1 (Solution B) solutions respectively. Stock solutions of sulphuric acid (1.0 M and 1.5 M) were prepared by adding 13.6 mL and 20.4 mL of 9598% pure sulphuric acid to sufficient cold distilled water and diluted to 250 mL with cold distilled water. Five tablets were weighed, grounded and mixed. After fine powdering of the tablets, an accurate weighed portion of the sample equivalent to contain 10 mg sparfloxacin was dissolved in 10 mL distilled methanol and vigorously shaken. The solution was filtered and diluted with distilled water in 100 mL flask. Sparfloxacin solutions in the range of 0.020.10 μg mL1 from 10 μg mL1 working standard solution were transferred to 100 mL beakers. To each solution, 4 mL of Ce (IV) solution B was added. The mixture was heated on boiling water bath for 30 min. On cooling contents of the beakers were transferred quantitatively to 25 mL volumetric flask and diluted up to mark with distilled water. Fluorescence intensity of the produced Ce (III) was measured at 352 nm after excitation at 250 nm against a reagent blank prepared by the same method without addition of the drug. Sparfloxacin solutions in the range of 0.020.20 μg mL1 from 10 μg mL1 working standard solution were transferred to 100 mL beakers. To each solution, 5 mL of Ce (IV) solution A was added. The mixture was heated on boiling water bath for 30 min. On cooling contents of the beakers were transferred to 25 mL volumetric flask and diluted up to mark with distilled water. The blank was prepared by the same method without addition of the drug and absorbance was measured at 315 nm by UV/ Vis Spectrophotometer (Model SP3000 plus, Optima Tokyo Japan) and the analyte absorbances were subtracted from the blank absorbance. Cerium (IV) is a good oxidizing agent. Its solution in acidic medium is yellow in colour with λmax at 315 nm while its reduced form Ce (III) is colorless and possesses an intrinsic fluorescence property having emission at 352 nm after excitation at 250 nm. Sparfloxacin reacts with Ce (IV) in acidic medium, reduces Ce (IV) to Ce (III). Quantification of the drug can be carried out by monitoring either the decrease in absorbance of Ce (IV) with the help of spectrophotometer or fluorescence intensity of the produced Ce (III) with the help of spectrofluorometer. The absorbance measurement at 315 nm for reagent solution [Ce (IV)] against a reaction solution [Ce (IV) with sparfloxacin] will give the amount of reacted Ce (IV) with sparfloxacin. While the fluorescence measurement of the reaction solution at 352 nm after excitation at 250 nm gives the amount of Ce (III) produced equal to the amount of sparfloxacin. Factors affecting the redox reaction of sparfloxacin with Ce (IV) were investigated by changing one variable while keeping the others constant through a series of experiments. The reaction between sparfloxacin and Ce (IV) was relatively slow at room temperature. Therefore, the effect of temperature and heating time on the redox reaction were studied in the range of 50100 oC and 1060 min, respectively. Maximum absorbance of the reagent blank against the analyte and maximum fluorescence intensity of the produced Ce (III) was found at 100 oC with 30 min heating time. The effect of acidity on the reaction was studied in the range of 0.02.5 M sulphuric acid solution. Maximum analytical signal was obtained with 1.0 M H2SO4. Above and below the optimum concentration of acid, decrease in signal was observed. To obtain stable and high fluorescence intensity 1.0 M H2SO4 solution was used throughout the work for preparation of Ce (IV) solution. Concentration of Ce (IV) solution affects the reaction very markedly. The influence of Ce (IV) was studied in the range of 50500 μg mL1 for both methods. It was found that with increase in concentration of Ce (IV) from 50 μg mL1 to 500 μg mL1, absorbance of the reagent blank against analyte continuously increases. Due to the maximum signal on the spectrophotometer, 500 μg mL1 Ce (IV) solution was selected for spectrophotometric method and 100 μg mL1 Ce (IV) solution was selected for spectrofluorometric method due to stable and reproducible results. The effect of volume of Ce (IV) solution on the absorbance behavior of Ce (IV) and fluorescence intensity of the produced Ce (III) was also investigated in the Sensitive spectrofluorimetric and spectrophotometric methods for determination of sparfloxacin in pharmaceuticals range 15 mL for spectrophotometric method and 18 mL for spectrofluorometric method. 5 mL of Ce (IV) solution A for the spectrophotometric method was found optimum volume and 4 mL of Ce (IV) solution B for the spectrofluorometric method was found optimum volume. Therefore, 5 and 4 mL of Ce (IV) solutions were used throughout the analysis. 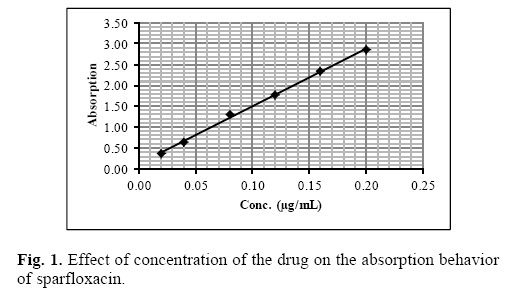 Under the optimum experimental conditions of the proposed methods, a linear relationship between the absorbance and concentration of sparfloxacin was observed in the concentration range of 0.020.2 μg mL1. A linear plot of fluorescence intensity with concentration of sparfloxacin was also obtained in the range of 0.020.1 μg mL1 for spectrofluorometric method. 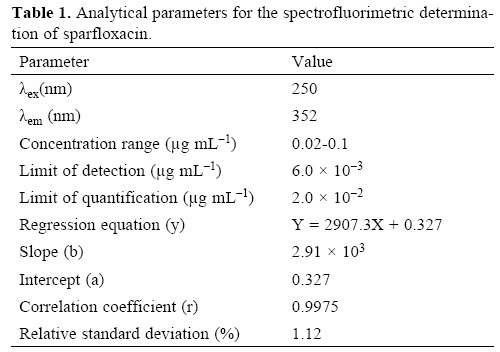 A calibration curve for spectrophotometric and spectrofluorometric method for determination of sparfloxacin is given in figure 1 and 2. The linear regression equations, slopes, intercepts, correlation coefficients, standard deviation and relative standard deviation of the response factors are given in table 1 and 2. The molar absorptivity was found to be 3.24 x 106 L mol1 cm1. The LOD (3 s/b) and LOQ (10 s/b) values were found to be 1.6 x 103μg mL1 and 5.2 x 103μg mL1 for spectrophotometric method and 6.0 x 103μg mL1 and 20.0 x 103μg mL1 for spectrofluorometric method respectively. The proposed method was validated according to ICH (International Conference on Harmonization) guidelines on the validation of analytical methods . 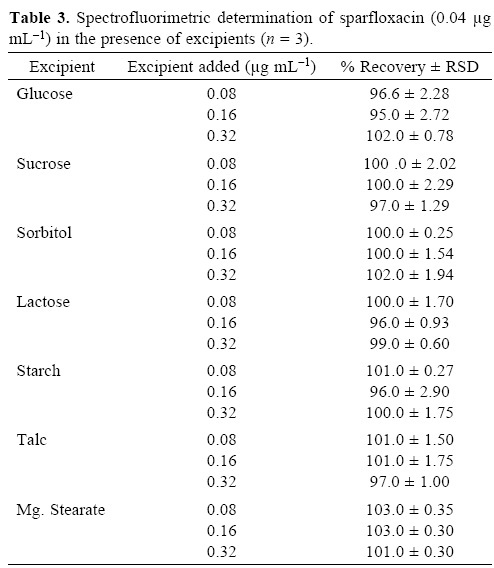 To evaluate the specificity (selectivity) of the developed methods for the analysis of pharmaceutical preparations containing sparfloxacin, the interferences effect of various excipients used in pharmaceutical preparations such as lactose, glucose, sucrose, sorbitol, magnesium stearate, talc and starch were studied. 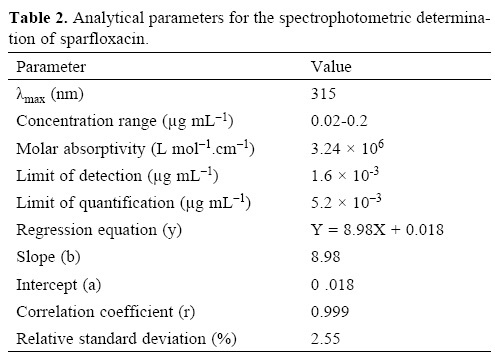 Solutions containing sparfloxacin and one of the excipients taken separately in concentrations four, eight and twelve times greater than that of the sparfloxacin were analyzed by the proposed spectrophotometric method and two, four and eight times greater than that of the sparfloxacin were analyzed by the proposed spectrofluorometric method. A level of interference was considered to be acceptable if the error was not higher than 3% relative to the expected sparfloxacin value. 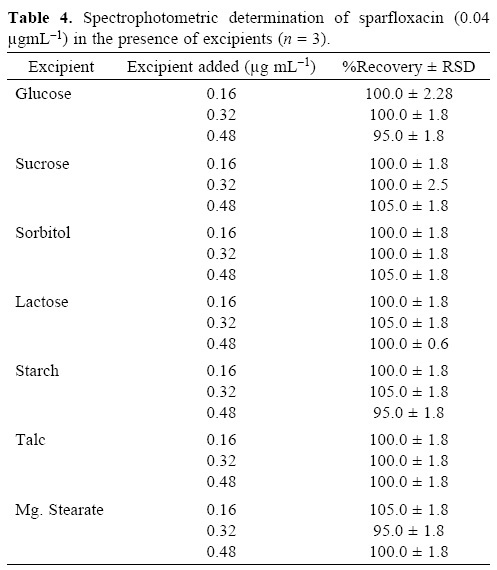 No interferences were observed in the determination of sparfloxacin in the presence of the common excipients studied (Table 3 and 4). The recovery of sparfloxacin was 95105% and 94.5103% for spectrofluorometric and spectrophotometric methods respectively. 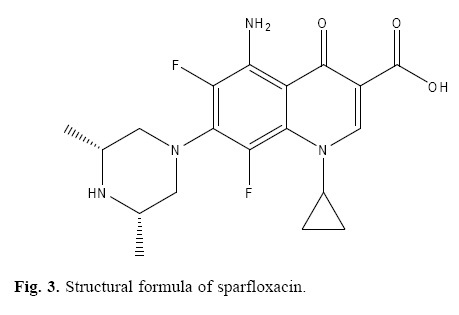 The degradation products of sparfloxacin were also studied to check the specificity of the present method. The method was found free of interferences from the degraded products of sparfloxacin. The degraded products of sparfloxacin aremainly oxidized products with changes at the piperazine ring (figure 3). Repeatability of the proposed methods was checked by determining three different concentrations of sparfloxacin in replicate for each concentration (0.020.06 μg mL1 for spectrofluorometric and 0.041.3 μg mL1 for spectrophotometric method). The results are summarized in table 5 and 6. The relative standard deviation (RSD) considered being very satisfactory (0.863.18%) and the recovery test was found to be in the range of 91.098.83% for spectrofluorometric method and recovery from 97.5100.83% with RSD from 0.891.82 for spectrophotometric method, indicates a good accuracy. The proposed methods were found useful for routine analytical and quality control analysis of sparfloxacin in pharmaceutical preparations as well as in pure form. To check accuracy of the proposed method, the standard addition technique was applied using three different brands formulations. The percent recoveries were in the range of 92.75 ± 0.92 % to 102.5 ± 1.73% (tables 7 and 8). 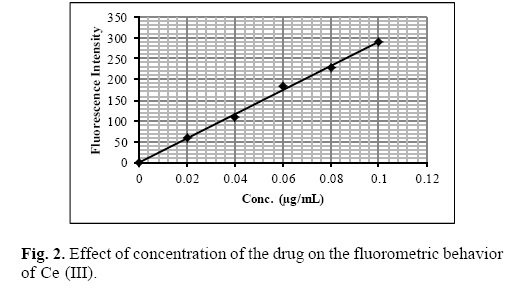 This indicates high accuracy of the developed method for sparfloxacin determination in pharmaceutical preparations. The stoichiometry between sparfloxacin and Ce (IV) was studied by molar ratio method. The results revealed that each mole of sparfloxacin con sumes 50 mole of Ce (IV), giving a mixture of oxidized products. The oxidation products were also checked by TLC and many spots were observed on TLC. It was attributed due to the presence of many centers in the sparfloxacin molecule liable to oxidation. The proposed method has been successfully applied to the determination of sparfloxacin in commercial formulation. The results obtained for pharmaceutical dosage forms were compared statistically with respect to accuracy by student ttest at 95% confidence level and precision by the variance ratio Ftest with those of the literature HPLC method. There was also no significant difference in precision between the proposed and literature methods. The results show similar precision and accuracy in the analysis of pharmaceutical dosage forms (table 9). The present study described the use of Ce (IV) reagent for the development of simple, sensitive, accurate and precise spectrophotometric and spectrofluorometric methods for the determination of sparfloxacin in bulk and pharmaceutical formulations. As compared to HPLC methods, the reagents used in the proposed spectrophotometric and spectrofluorimetric methods are readily available and the procedure does not involve any tedious sample preparation. The developed methods are simple and readily adaptable in the quality control laboratories.